With the 2019 Parking Industry Expo just around the corner, it’s time to start thinking about how you are going to plan your busy days in Chicago. 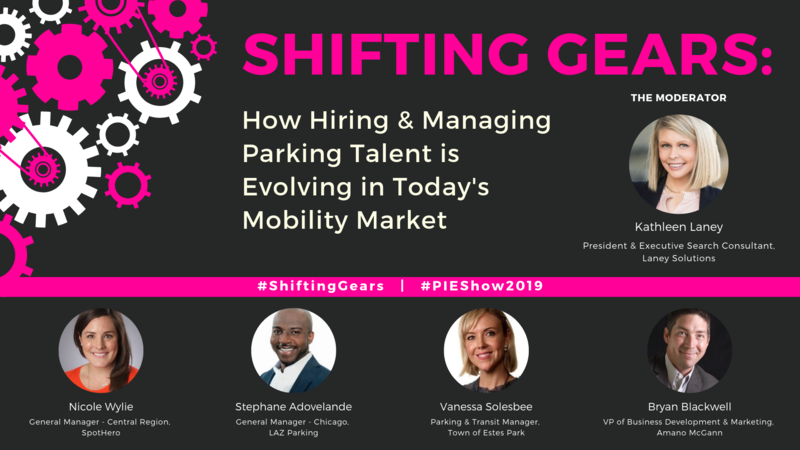 Make sure to mark a spot on your calendar for what is certainly going to be a highlight of this year’s show, the panel discussion, “Shifting Gears: How Hiring and Managing Parking Talent is Evolving in Today’s Mobility Market,” hosted by Kathleen Laney, President of Laney Solutions. With unemployment at an all-time low, the job market is now largely candidate-driven, with more jobs available than candidates to fill them. For parking employers, that means it’s getting harder and harder to find and keep quality talent. And in today’s fast-changing world of mobility, it’s important for parking employers to attract and retain the best teams possible in order to stay agile and competitive. Laney Solutions is the leading parking industry recruitment firm specializing in middle and senior management, experienced sales professionals and executive level placements. Driven by client and candidate satisfaction, we target and locate quality candidates who possess very specific skills, experience, education, training and more – to match our client’s exact requirements. Learn more by visiting www.laneysolutions.com. or contacting Kathleen Laney directly at kathleen@laneysolutions.com.